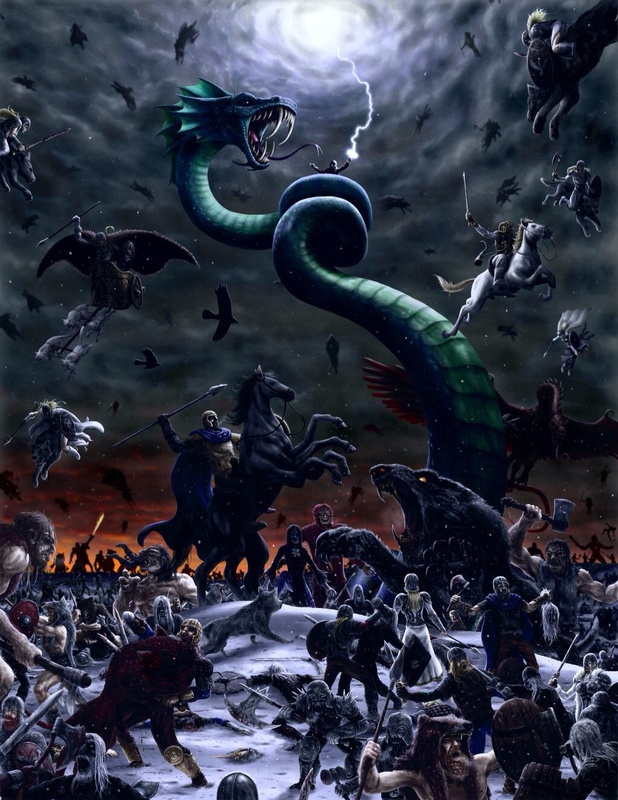 According to Norse Mythology Ragnorok is said to occur on Saturday 22 February 2014. Ragnarök is a series of future events, including a great battle foretold to ultimately result in the death of a number of major figures (including the gods Odin, Thor, Týr, Freyr, Heimdallr, and Loki), the occurrence of various natural disasters, and the subsequent submersion of the world in water (we’ve already had loads of flooding and the Severn is still high). Afterward, the world will resurface anew and fertile, the surviving and returning gods will meet, and the world will be repopulated by two human survivors. Ragnarök is an important event in the Norse canon, and has been the subject of scholarly discourse and theory. The event is attested primarily in the Poetic Edda, compiled in the 13th century from earlier traditional sources, and the Prose Edda, written in the 13th century by Snorri Sturluson. In theProse Edda, and a single poem in the Poetic Edda, the event is referred to as Ragnarök orRagnarøkkr (Old Norse “Fate of the Gods” or “Twilight of the Gods” respectively), a usage popularized by 19th-century composer Richard Wagner with the title of the last of his Der Ring des Nibelungen operas, Götterdämmerung The Old Norse word “ragnarok” is a compound of two words. Ragna means “conjure” and is used metonymically to refer to beings, most notably creator-gods, who possess the power of conjuring as an attribute. The second word, rök, has several meanings, such as “development, origin, cause, relation, fate.” n Icelandic (ca. 1200) the word was rok, derived from Proto-Germanic *rakō. the word ragnarök as a whole is then usually interpreted as the “final destiny of the gods.” in 2007, Haraldur Bernharðsson proposed that the original form of the second word in the compound is røk, leading to a Proto-Germanic reconstruction of *rekwa and opening up other semantic possibilities. In stanza 39 of the Poetic Edda poem Lokasenna, and in the Prose Edda, the form ragnarøk(k)r appears, røk(k)r meaning “twilight.” Ragna means conjure, roekrs means caring (“conjure caring the voices of the victory gods”). It has often been suggested that this indicates a misunderstanding or a learned reinterpretation of the original form ragnarök. Haraldur Bernharðsson argues instead that the words ragnarök and ragnarøkkr are closely related, etymologically and semantically, and suggests a meaning of “renewal of the divine powers.” usage of this form was popularized in modern popular culture by 19th-century composer Richard Wagner by way of the title of the last of his Der Ring des Nibelungen operas, Götterdämmerung. Other terms used to refer to the events surrounding Ragnarök in the Poetic Edda include aldar rök (aldar means age, “end of an age”) from stanza 39 of Vafþrúðnismál, tíva rök from stanzas 38 and 42 of Vafþrúðnismál, þá er regin deyja (“when the gods die”) fromVafþrúðnismál stanza 47, unz um rjúfask regin (“when the gods will be destroyed”) from Vafþrúðnismál stanza 52, Lokasenna stanza 41, and Sigrdrífumál stanza 19, aldar rof (“destruction of the age”) from Helgakviða Hundingsbana II stanza 41, regin þrjóta (“end of the gods”) from Hyndluljóð stanza 42, and, in the Prose Edda, þá er Muspellz-synir herja (“when the sons of Muspell move into battle”) can be found in chapters 18 and 36 of Gylfaginning. Eight years later in 1456, Vlad returned and this time prevailed. His plans, to strengthen the country’s army, economy and his own position, required ruthless determination – and Vlad had both in spades. He began by weeding out the most troublesome members of the aristocracy, killing many and forcing the rest out of power.He extended the campaign to their allies, the Transylvanian Saxons, and enacted laws that increased the penalty for crimes such as theft to death. With Wallachia secure, he turned his attention to the Ottomans to whom he was expected to pay vast sums of money in tribute, and allied himself to Hungarian ruler, Matthias Corvinus.In 1462, the Ottomans, under Sultan Mehmet II, invaded, bringing their army of 90,000 men against Vlad’s estimated 30,000 troops.He responded with breath-taking cruelty, showing no mercy to prisoners and, according to legend, leaving a forest of impaled Turkish soldiers for the Ottomans to find. Although his campaign of guerrilla attacks and night ambushes slowed the Turkish advance, by 1462, Vlad was trapped at Poenari Castle by Turkish forces led by his younger brother Radu. Forced to flee, Vlad lived in exile until the death of his brother Radu in 1475 left the Wallachian throne unoccupied once more.He announced his return to the throne and by the end of 1476 had begun a new campaign to end Ottoman rule in Wallachia.But just two months in, Vlad was killed and his body buried in a monastery on an island in the middle of Lake Snagov. His head was taken to Istanbul. The Brit Awards 2014 take place at the O2 Arena on Wednesday, February 19. See below for a full list of this year’s nominees.